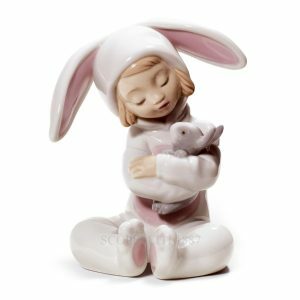 LLADRO BUNNY HUGS figurine with gift box. This incredibly charming glazed porcelain figurine in pastel colours portrays a little child in a dusty pink bunny suit with enormous ears giving lots of hugs to her pet rabbit. The artist perfectly captures that naivety and innocence of youth with the child lovingly looking down at its cuddly pet as if it were a baby to cradle.